One of the oldest Ginkgo biloba trees outside Asia grows in Geetbets (37 Dorpsstraat, next to the church) in Belgium. Planted c. 1750. I made this HD-video in October 2012. * Added on Tree-page: HD-video of one of the oldest Ginkgo trees outside Asia: Geetbets, Belgium, c. 1750. * Added to the poem 'The Consent' by Howard Nemerov: French translation. Video taken by a remote-controlled AR.drone (quadrocopter) of a large Ginkgo tree in fall. Video on YouTube by Folkboys. 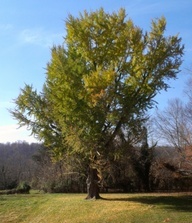 Daily photos of Ginkgo tree at Oatlands, VA.
Each year Oatlands (Oatlands Historic House and Gardens near Leesburg, Virginia) posts nearly daily photos of its magnificent Ginkgo biloba tree (planted c. 1860) during the autumn season. They are posted on Pinterest and this blog. Enjoy! Giant old Ginkgo tree, c. 1,150 years old. Location: Yongmunsa Temple, Yangpyeong, Gyeonggi Province, South Korea. Rows of Ginkgo trees line both sides of the street leading up to the temple. "The most impressive thing at Yongmunsa Temple is the old giant ginkgo tree. This ginkgo tree was nominated as Natural Monument No. 30 on December 3, 1962 when it was 1,100 years old, so the tree is now about 1,150 years old. This giant ginkgo tree is 42 meters high with a circumference of 14 meters at the height of an adult’s chest and its boughs are spread extensively - 14.1 meters to the east, 13 meters to the west, 12 meters to the south and about 16.4 meters to the north. 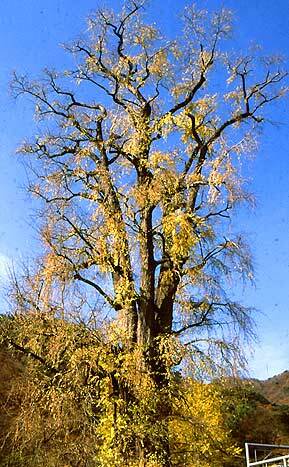 The giant ginkgo tree of Yongmunsa Temple is a female tree and has a large lump on the lower part of its trunk. This ginkgo tree is the tallest tree in Korea and also is the largest ginkgo tree in the orient. Compared to common trees, this tree has grand and stately bearing that amazes those who see it. According to a legend it is said that Prince Mauitaeja of King Gyeongsun of the Silla Kingdom planted the ginkgo tree on his way to Diamond Mountain to hide himself away and console himself for having lost his kingdom. Another legend says that the great monk Uisangdaesa put his wooden stick into the earth and the stick grew into a giant ginkgo tree. " More info and photos on my website. Video by hanami20 on YouTube: Ginkgo trees in fall, campus Hokkaido University, Sapporo, Japan. "Hurricane Sandy's howling winds tore a limb from one of the most beloved members of Timothy Dwight College Monday afternoon, ripping down one of the upper branches from the massive ginkgo tree stationed in the TD courtyard. Timothy Dwight Master Jeffrey Brenzel addressed the loss in a Monday evening email to the TD community, writing that he expects the ginkgo to survive." Another video (2006) on YouTube of this Ginkgo tree. * Added to my Art-page: photos I made of Ginkgo Project Beekbergen (architecture).